Check in online and save time at the airport. You can also choose your seat at no extra cost and then print your boarding pass or elect to receive a mobile boarding pass. 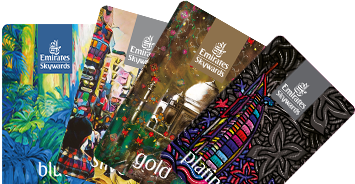 Remember to enter your Emirates Skywards number to earn Miles on your flight. 90—Get to the airport no later than 90 minutes before departure. 60—Go through security no later than 60 minutes before departure. 45—Boarding starts 45 minutes before your flight, and gates close 20 minutes before departure. Can I use online check-in for other passengers in my traveling party?